We traveled to San Antonio for our Spring Break vacation. 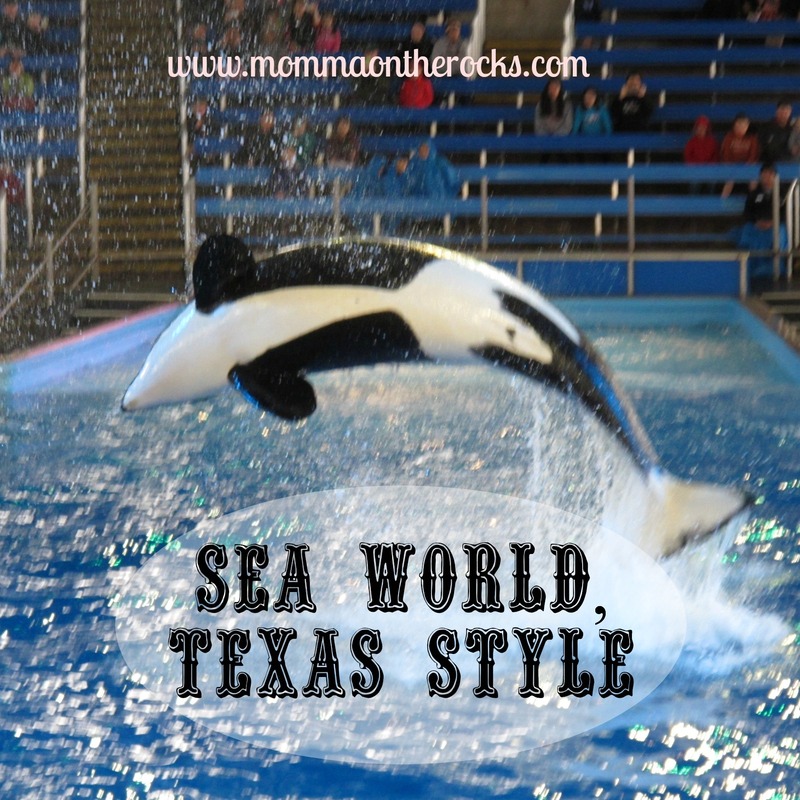 One of the top things on our to-do list was Sea World San Antonio. The morning had started out overcast and chilly, but we didn’t let it deter us! With confidence in the weatherman’s forecast, we headed out to the park. We found the best deal online at the SeaWorld website; we printed our tickets at home (including pre-paying the parking – you save $2) and we headed straight for the security check at the entrance. It appeared not everyone was as brave as us, and crowds were light and manageable. The best part about the cooler weather: there was no wait on Sea World’s two coasters, The Great White and Steel Eel. Happy that our kids are old enough to be left at the exit of the ride on their own so that the Hubs and I could ride together (for the first time in over 12 years!) we ran like little kids ourselves to get in line for The Great White, which turned out to be one of the smoothest coasters I’ve ridden on in a while. Whee! As I may have mentioned before, coasters are NOT Boo’s thing. He (mostly) happily agreed to be the official bag holder in exchange for not being asked to go on any other coaster-like rides. While we were excited about the coasters, we weren’t as excited as getting wet while the weather was still cool, so we took a pass on the park’s two water rides, Rio Loco and Journey to Atlantis (opting to save them for a future trip, along with a return visit to Aquatica). We were easily able take in nearly all the shows. My daughter’s favorite was “Azul”, which included beluga whales, dolphins and birds along with the slapstick antics and tricks of a clownish performer along and acrobatics of performers dressed as birds, fish and lizards. TIP: The best way to avoid crowds at mealtimes is to eat at the closest restaurant to a performance already started. Afterwards, we went to the dolphin pool where some guests were taking part in the Dolphin touch experience. I wasn’t fast enough to book a spot for the obviously popular option, but it is on my to-do list for a future visit. Miss M was tickled at the idea of getting close enough to touch a dolphin so you can imagine her excitement when I told her that you can book an experience to swim with the belugas! One of my favorite shows is always One Ocean. Ecology lessons combined with performances by their killer whales and a LOT of splashing are what this show is all about. Tip: if your kids like to get wet, bring along a disposable waterproof camera for up-close action – along with an inexpensive rain poncho (found at large discount stores or dollar stores)! We finished the day with the lumberjack show, pitting lumberjacks from Alaska vs Texas in contests like ax throwing, pole climbing and log-rolling. It was noisy fun! At that point, we were cold and tired, so we opted to call it a day. 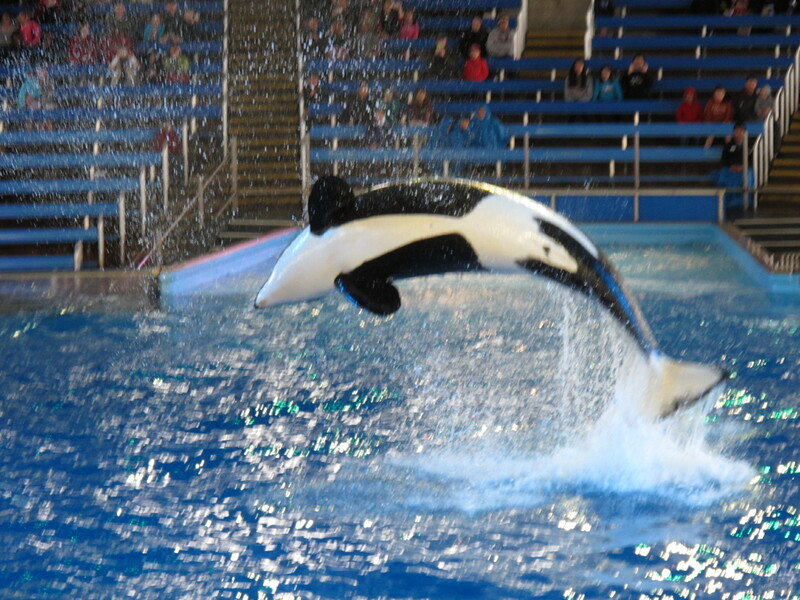 However, there was much yet unseen (including the feeding of the sea lions) so we are looking forward to our next trip to Sea World San Antonio – hopefully in warmer summer weather! Next PostProtect our Athlete’s Noggins with Remove From Play Testing. Great account and pictures, Jenn. I feel I’ve been there, too! So Fun & great tips! Looks like you guys had a blast!